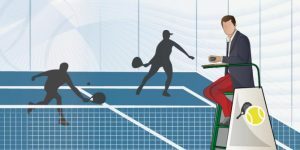 Padel courses for umpires coming soon. The courses provided will be fully compliant with the International Padel Federation. Active Umpiring. In active umpiring play stops once the umpire has called a decision signalling all infractions to the rules. II.9.15. Passive umpiring. In passive umpiring the umpiring team intervenes directly when points named in II.9.14. arise but in all others act at the request of players. The Chair Umpire shall be obligatory in all finals and semi-finals of the Tournaments included in the I.P.F. Official Calendar and in the World and Continental Championships. It is not obligatory in any Junior World Championship Categories.